When I was growing up, my family usually had either Chicken Cordon Bleu or this easy, oven roasted BBQ Beef Brisket for Christmas dinner. This brisket is another one of my mom’s recipes collected from a church function when we were living in St. Louis in the early 80’s. The story she tells is that it came from “a bachelor” in the ward congregation that my family attended at that time, but I don’t know any more about this mysterious bachelor other than he made one heck of a brisket! 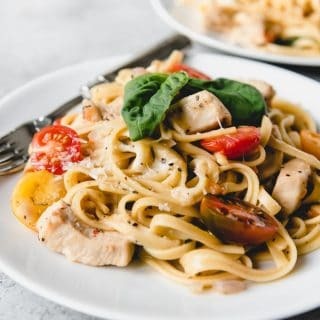 I have made this for years now and it is always one of my most requested recipes, so I knew it was one I needed to share on this blog. When we sat down to dinner last night, Clara (age 5 1/2) saw this brisket on the table and a huge grin split her face as she exclaimed that we were having “Who-Roast Beast” for dinner. Clearly it’s 3 days before Christmas and we have been reading “The Grinch Who Stole Christmas” and watching the old animated version of the movie a lot around here! I don’t remember having that thought as a kid, even though we always eat brisket in December, but it makes perfect sense and I love that she made the connection! 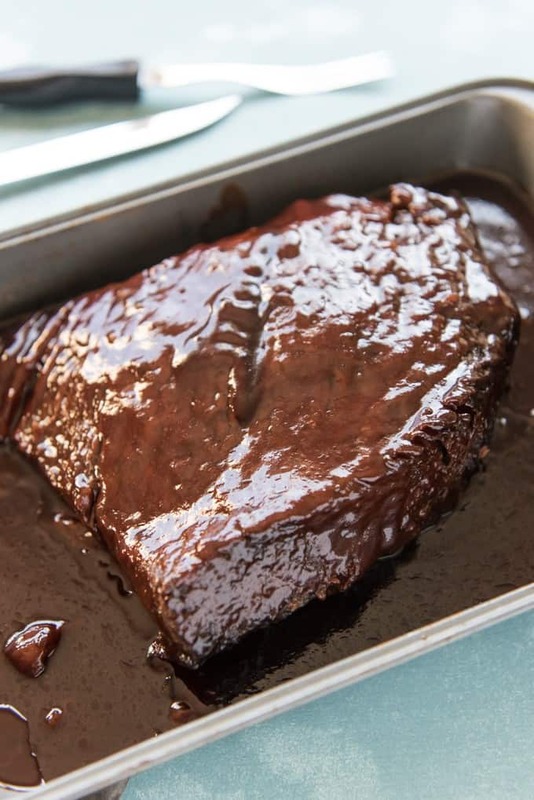 Here is the thing about brisket, if you have never cooked one before: it needs to be cooked slowly, at a very low temperature for many hours in order to dissolve the tough connective tissues of the meat. Do that and the meat will be so tender that is should practically fall apart when you cut it. 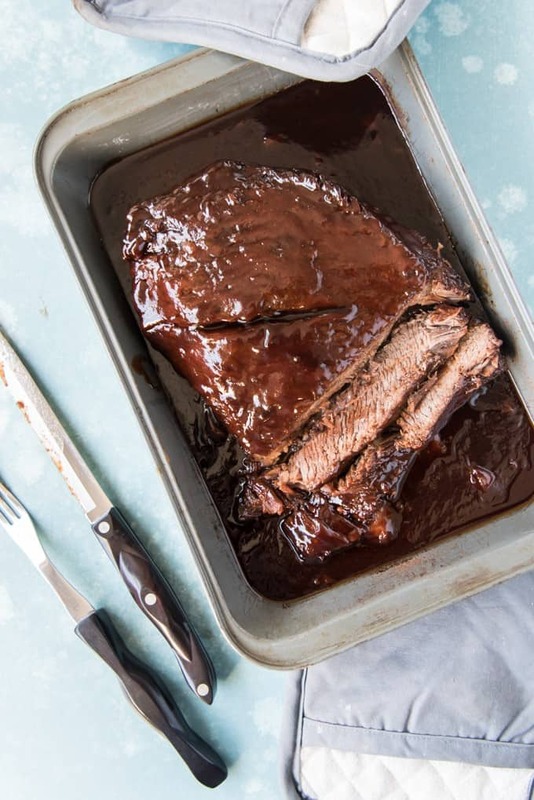 The general rule is that you need to cook your brisket for 1 hour for every pound of meat, although with this recipe I always give it an extra 30 minutes to an hour after adding the barbecue sauce so that the sauce can heat up and combine with some of the juices coming off the meat. So if you are cooking a 5-pound brisket (like the one in these photos), you need to plan on 5 hours of cooking time for the brisket plus a little extra time at the end for heating up the sauce. But it works just as well with a 12-pound brisket that would take 12 hours to cook. 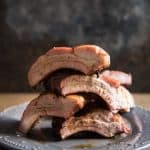 We have enjoyed this incredibly succulent oven beef brisket recipe every year since and it has become a go-to recipe when planning food for a crowd. 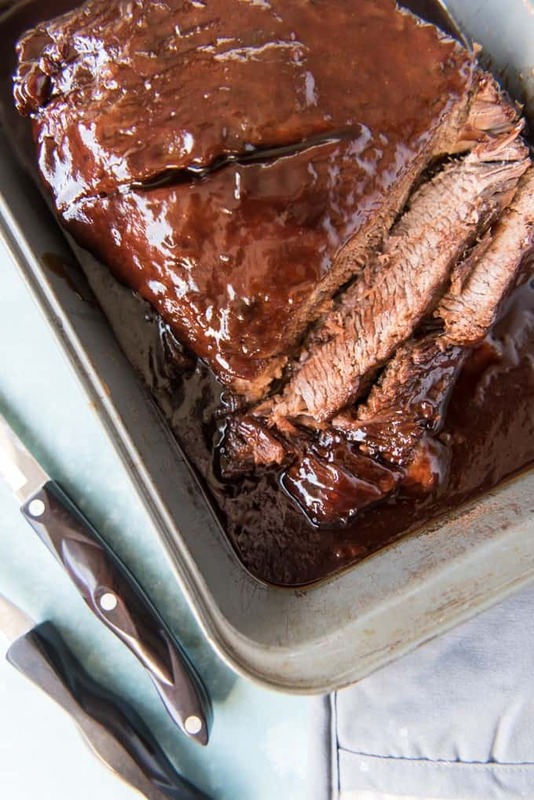 My mom has served this easy BBQ beef brisket for a crowd at countless family gatherings, large and small over the years, and I have come to rely on it just as much. When I was asked to be in charge of the Christmas dinner at church a few years ago, this is the recipe I went to because I knew the results were reliable, it was practically foolproof, and everybody would love it. Plus, since I couldn’t cook 120 pounds of meat myself, I could just farm out individual briskets and ingredients to a few friends with double ovens who could start the meat first thing in the morning so they could roast all day and be tender and ready for slicing that night at the party. But we definitely don’t reserve this easy BBQ beef brisket for the Christmas season. It’s a great Sunday dinner, especially when you have company, or you can make it for a summer BBQ, no grill or smoker required and no one will be the wiser! The meat comes out smoky and tender and sweet thanks to the hickory and brown sugar barbecue sauce and a long, low and slow roasting time. And if you have a large electric roaster or a big enough crock pot and small enough brisket, you could totally cook it in there as well. My favorite side with BBQ beef brisket is my copycat Costco mac and cheese, although I also really love serving it with twice baked potatoes or creamy potluck potatoes. But you could serve it with baked beans, coleslaw, cornbread, baked potatoes, cold macaroni salad or any other Southern sides you like! I’m also partial to green beans with it, either the plain steamed variety or these amazing green beans with bacon & pine nuts! One of my favorite things about BBQ beef brisket are the leftovers! I love to chop up the leftover meat and use it to make some extreme BBQ beef brisket nachos or quesadillas or serve it on a crusty bun with some extra BBQ sauce for a brisket sandwich. That sandwich is even more incredible if you take the extra minute or two to butter the insides of the crusty bun and grill the buttered sides on a hot pan for a bit before adding your meat to it! 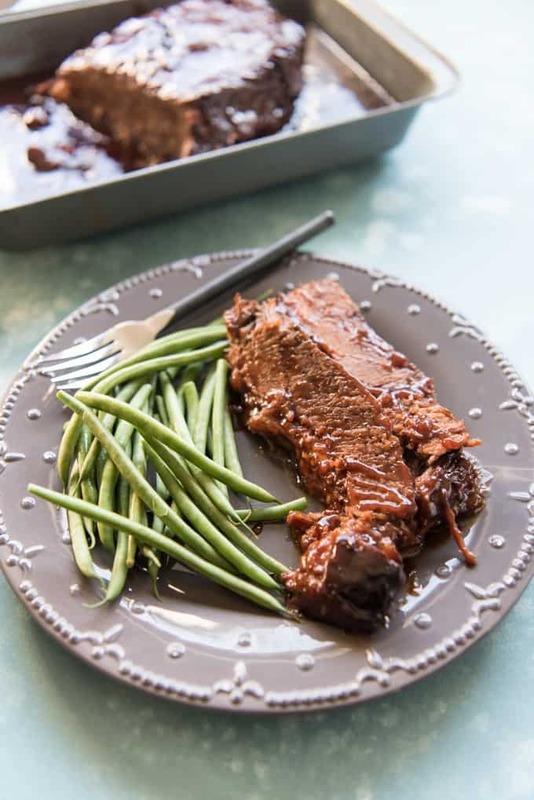 Slow Roasted Oven BBQ Beef Brisket is so tender and juicy, with a sweet & smokey hickory barbecue sauce, that no one will care that the meat wasn't cooked by a Texas pitmaster! The night before you plan to cook and serve the brisket, combine the salt, celery salt, garlic powder, onion powder and sugar in a small bowl and set aside. Place the brisket in a large roasting pan and trim the fat if it is super thick, but leave at least a 1/4" layer on the bottom. 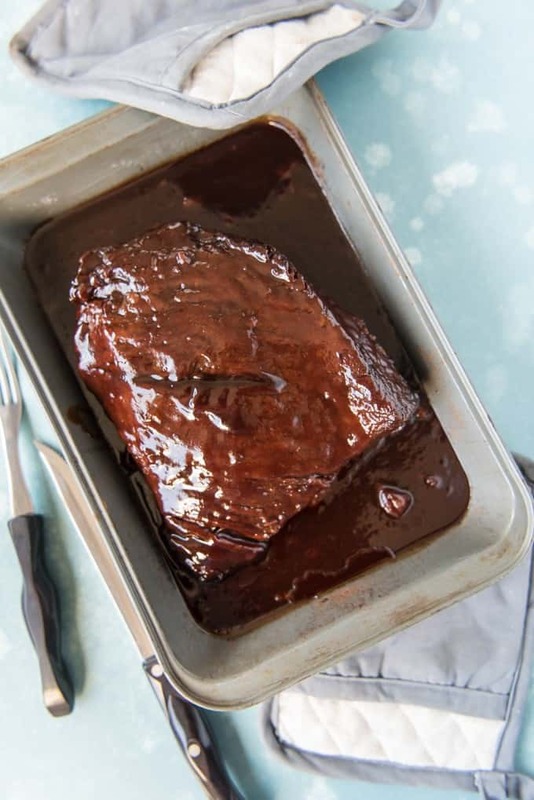 Moisten the brisket with the Worcestershire sauce, then sprinkle the top and bottom of the brisket with half of the mixed seasonings, reserving the other half. 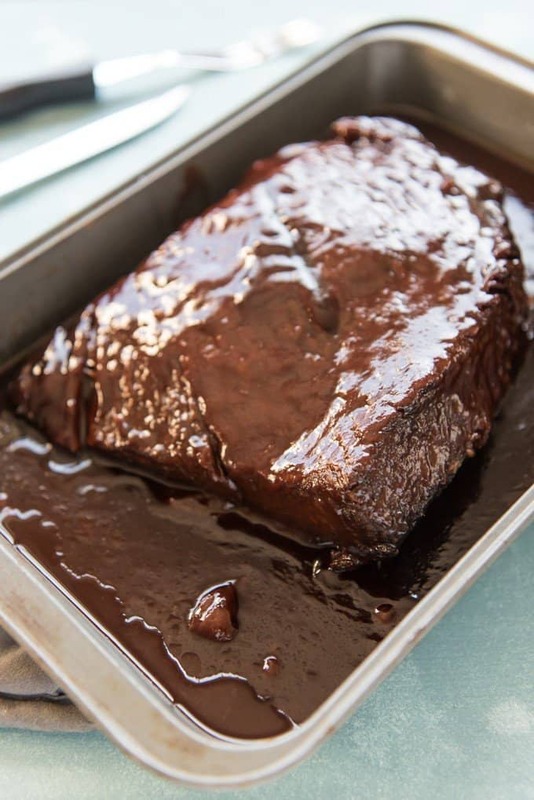 Cover tightly with foil and place in the refrigerator overnight. The next day, preheat the oven to 250 degrees. Remove the brisket from the fridge and uncover. Sprinkle it with the remaining seasonings, then cover it with foil again and place it in the oven to roast for 5 hours (approximately 1 hour per pound of meat). Remove the brisket from the oven and remove the aluminum foil. Pour off the fat. In a medium bowl, stir together the brown sugar and barbecue sauce, then pour it over the brisket. 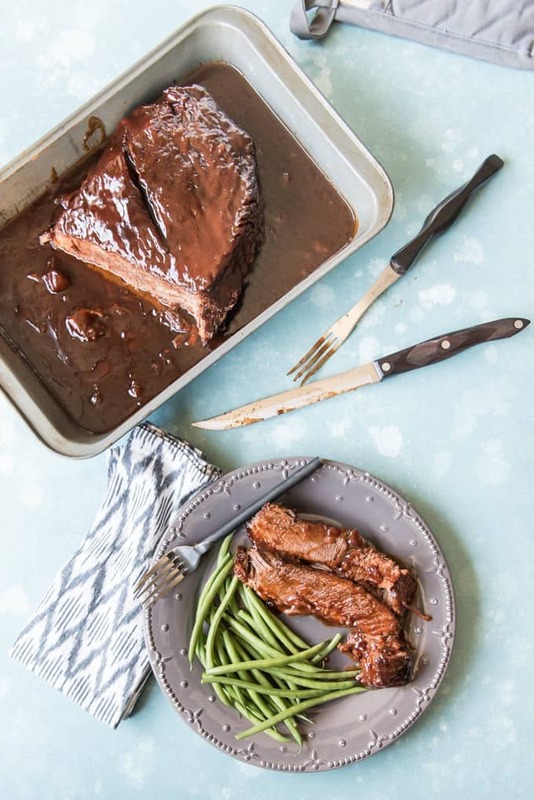 Increase the oven temperature to 350 degrees, then return the brisket to the oven, uncovered, and roast an additional 30 minutes to an hour, or until the sauce is hot and the meat is tender. Slice or chop and serve. 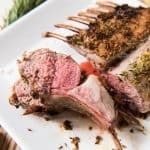 You can use whatever barbecue sauce you like, but I think a hickory or mesquite flavored sauce adds a smokiness to this dish that you don't get from the oven. Details: In exchange for filling out a short survey, I’m giving away a chance to win one of two (2) $25 Amazon gift cards. This giveaway runs through 12/24/18. Winners will be contacted on or around 12/26/18. How to enter: Fill out the below survey and include your name and email address (I will not spam you or even add you to a mailing list, it’s just to be able to contact the winners and send the gift card to them). Terms and Conditions: There will be two (2) winners and each winner will receive one (1) $25 Amazon gift card. The winners will be notified on or around 12/26/18. This giveaway is only open to legal residents of the fifty United States and District of Columbia who are at least 18 years old as of the date of entry, except anyone directly associated with House of Nash Eats. This promotion is void outside the fifty United States and the District of Columbia, and where prohibited. One entry per person. I haven’t actually made my brisket in a slow cooker before as mine isn’t large enough to hold a brisket or any decent size, but I’m sure it would work. I would set the slow cooker to high and follow the same 1 hour per pound of meat ratio as a starting point, but you will want to check it as the speed at which the brisket would cook might also depend on how much extra space remained around it in your slow cooker. Can you use a small piece of brisket?. Sure, Babs – just adjust the cooking time using the same formula of 1 hour per pound of meat! When it’s in the fridge with the rub, is it completely wrapped in foil, or is the brisket in a pan which is covered with foil? I find it’s just easiest to keep it in a pan and cover the whole thing with foil. Want to do this in my oven for 25 people. Would be great to figure out a way to do this the day before. Any suggestions? 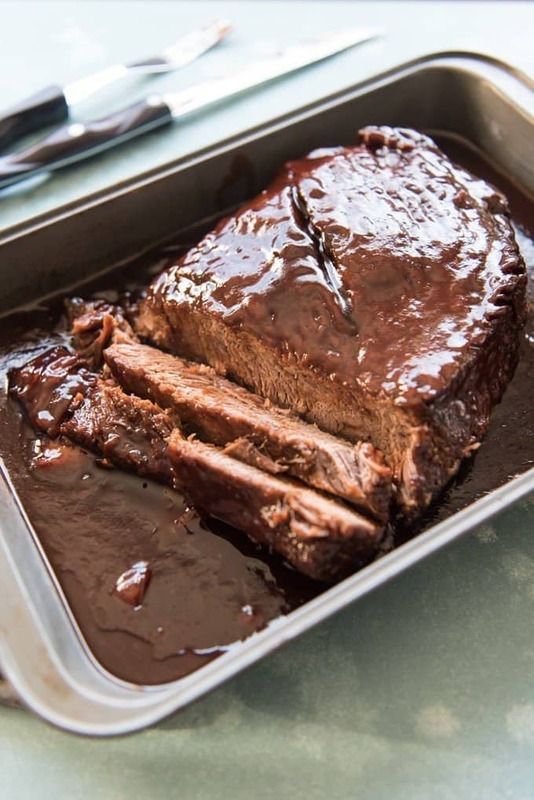 It’s really not hard to do the day of, since really it just roasts the whole time, but if you prefer to do the entire cooking process in advance, I would just cook it all the way through the bbq sauce stage, then wrap it up well in aluminum foil and transfer to the fridge. On the day you plan to serve it, just reheat in a 350 degree oven for 45 minutes to an hour until heated all the way through. I want tp pre cook the brisket to take on vacation. Could I slow cook my 9.5 lbs brisket for 8 hours @ 250/225 and then finish it off the next day or 2 with the BBQ sauce ? Absolutely! It reheats really well! I’m not sure how much additional time you would need at 200 degrees, but yes, I would cook it until the internal temperature reaches 190 degrees. Maybe start at 1 hour 10 minutes per pound instead of 1 hour and see where that gets you! Was thinking about this for a party. Ill have 50 people and lots of other food. I thought some chicken and some brisket. a few questions. 1) does this work as well with chicken? 2) how much food? I was thinking 15 lbs of brisket and maybe 10lbs of chicken. 3) do you always slice or do you shred it? I ask because i was thinking about serving with rolls for people to make bbq sandwiches 4) what sides do you serve with this? typical bbq stuff? Coleslaw, cornbread, greens? I haven’t tried this method with chicken, so I really can’t say. Although if I were to try it, I think I would do it with bone-in chicken pieces. I would say for 50 people, you will probably want about 40 pounds of brisket (prior to cooking) if that is the only meat you are doing, and obviously less if you are providing more than one meat option. Although depending on age of eaters and appetites, you might want to adjust from there. It sounds like a lot, but brisket will cook down during the long, slow roasting process. I prefer it sliced, but you could definitely shred if you want to. The meat will be tender enough that people could still put slices of brisket on rolls for sandwiches, which is something I love to do myself. For sides, I love serving brisket with this perfect cornbread, my favorite macaroni & cheese, and these green beans with bacon and pine nuts. But yes, any other traditional sides like coleslaw, greens, corn on the cob, etc. would be wonderful! 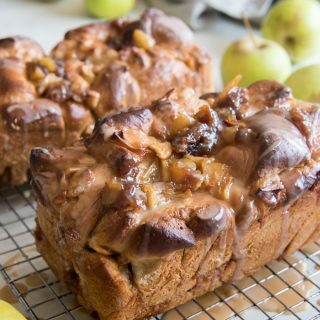 I just found this recipe and an going to try it. My question is about the brisket. I never know how to buy one. I was reading and saw they pretty much sell a flat one, a point and then the whole that is basically both. Any tips on buying one? It really depends on how many people you want to feed, I think. I almost always just do a flat one if it’s just for my family, but if doing this for a crowd, I do the bigger cut that has the flat and the point. Either works great, you just need to adjust the cooking time based on the amount of meat. Making this tomorrow for a group of 40! Curious, can I cook 2, 10 lb briskets at the same time for 10 hrs? Yes, you should be fine as long as there is room in your oven for enough circulation between the briskets. If they are in the same pan together, touching, that’s going to affect the cook time. But if they are in two separate pans and both fit in the oven, then it will work just fine! Thank you, thank you, thank you! I’ve never been able to do brisket right, but this turned out amazing!! I can’t wait to make it again! I found this recipe via google and used it to cook a 7lb Brisket for our Thanksgiving dinner this year. I followed the recipe exactly as written and it was REALLY good! It was moist and tender and very tasty. Everyone gave it 5 stars! 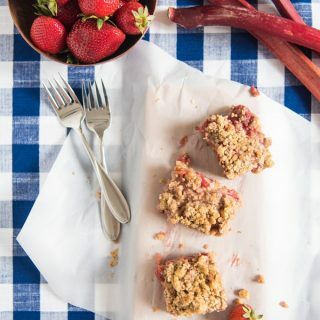 This recipe is a keeper and I can’t wait to try some of your other recipes. I’m so glad you enjoyed it! Happy Thanksgiving! I made a 5 lb. flat cut brisket today employing your recipe. This was far and away the tastiest brisket I have ever made! Past attempts were always 225-230 degrees. I think the elevated temperature of 250 and then additionally one hour at 350 degrees made all the difference. This brisket emulates a Texas style brisket that is both juicy as well as juicy. You kindness and generosity is exceeded only by your good looks 😉 Thanks for sharing! I’m so glad you enjoyed this brisket recipe! *** I just realized that I cooked your Instant Pot Beef Stew 2 weeks ago. I didn’t pay attention to the website, just the recipe! OK it was the bomb (see my comment on that page). Wow, I’m sold – please move to Colorado and open a restaurant! Ann, you are so sweet. I’m so glad this turned out well for you and was so happy to help! Sending hugs and warm wishes your way! I have an 11# brisket that I would like to cook in my electric turkey roaster so that my oven is free for the day to prepare the side dishes. The concern I have is with the depth of the roaster pan. If I cover the roaster with foil will it make a difference if there are several inches of additional air space between the meat and the foil? The pan in my electric roaster is deeper than what I would use if I cooked in the oven and I definitely don’t want to roast it for 11 hours and it be dry. The lid to the roaster is vented to release steam so I’m thinking I shouldn’t try and use that at all. Also, fat side down and no liquid in the bottom of the pan , right? Right – fat side down and no liquid. I’ve done it in one of those roasters before and just covered with foil and then topped with the lid as well. It worked just fine. Had the brisket last night. A solid hit with our family of seven. Cut with a fork tender. I left most of the fat-cap on, and roasted fat-side up. Finished with Stonewall Kitchen Maple Chipolte Grille Sauce – which has become our family favorite Barbeque sauce. Paired with steamed green beans. Only problem – wasn’t enough brisket! Next time I’ll have the butcher add at lest two more pounds. 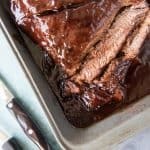 I have always heard to oven bake and/or smoke a brisket with fat cap up for juices to melt down into the meat for best moistness, any reason for yours being fat cap down? Just curious, not negative! Lol, no reason, I guess I just didn’t think about that the day I was making this and taking pictures. Truthfully, we’ve made it both ways and personally I don’t think I can really tell a difference whether it’s cooked with the fat cap up or down unless it’s being done on a smoker. Hey im cooking it right now actually but i want to confirm if the temperature you mentioned is in Fahrenheit and not Celsius , thank you. And does it matter if i dont sear the brisket first.? So sorry I didn’t see this while you were making it, but yes, the temperature is in Fahrenheit, not celsius. For a 12 pound brisket should I double the seasonings? What are your thoughts about throwing it on the grill after the initial cook time and searing the BBQ sauce mixture that way at about 350-400 degrees for 30 minutes? Add smokiness or will dry out over cook? Hmm, that’s a really good question. My guess is that the amount of smokiness it might add wouldn’t be worth it since it wouldn’t be able to penetrate into the meat much in that amount of time. But it would be worth a try! This sound delicious, but not everyone in our house likes BB sauce. What would you suggest for the last 30-60 minutes? Thank you. I don’t know that I would do the final 30-60 minutes if I wasn’t doing sauce. At that point, the meat should pretty much be close to done anyway – the last bit is to heat and sort of caramelize the sugars in the sauce. Hi Amy! I’d like to try and make it decent 🙂 Do you have any other sauces that I could use instead of BBQ? Hmm, I have never thought to try it with a totally different sauce. Maybe teriyaki? I really don’t know! If you try one, let me know what you use and what you think!